Pink Chiffon Hibiscus from Proven Winners has the same flower power and soft, graceful stems of other Chiffon varieties, but with large, soft pink flowers. The clear pink of Pink Chiffon is an unusual addition to summer gardens. This Hibiscus can be trained up a small tree and also resists deer. Pink Chiffon Rose of Sharon Hibiscus from Proven Winners has large, lacy pink summer flowers that attract butterflies. It is adaptable, easy-to-grow, deer resistant, and heat and salt tolerant. Prefers full sun (6+ hours) and is adaptable to most soils. Grows to be 8-12 feet tall and 4-6 feet wide. At time of shipment, this plant will be about 1 year old. Blooms from early to late summer with pink flowers. Can be heavily pruned, though this isn't necessary. One gallon shrubs are 6-18 inches tall when shipped, depending on the season. Young plants can be used in containers but will need to be moved to landscape as they mature. They can be trained into a small tree. Excellent in landscapes, mixed borders or as specimen plants. (3 Gallon Plant), POWDERBLUE Rabbiteye Blueberry- Berries Are Very Light Blue in Color, Medium in Size with Good Firmness and Flavor, Ripens Mid Season. Florida Sunshine (Anise)Year-Round Glowing Light Green Leaves, Wonderfully Licorice Scent. 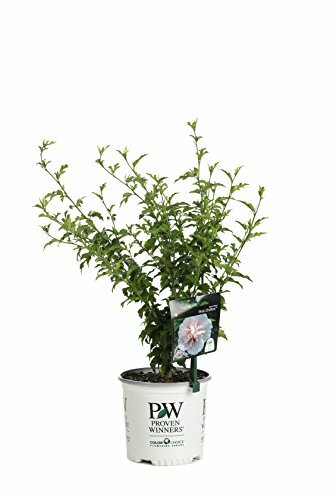 (10 count flat - 4.5" pots), Ficus pumila Creeping Fig, Small, dark green textured leaves, low growing, tight foliage, great wall climber, prefers well-drained soil. Light foot traffic. (Quart) blue deodara cedrus Electra Blue Deodar Cedar. 30 feet. Sunlight.Quart size plant shipped in plastic bag or 3" pot. (1 Gallon Plant) AUTUMN FERN, One of the Most Impressive Ferns, Dazzling Display of Color for Every Season-Starting from Copper to Light Green to Orange Copper.